lovely voice. I also be close by Your side. When I do feel myself at home is when I am where you are. Dear Collie. Yours of the 28th It was handed to me on the morning of the 29th by Nathan. He called to me. I was in the Barn at work. And most asurdly I went out & while on my way out, he was telling me he had made a change in the plan of his barn. 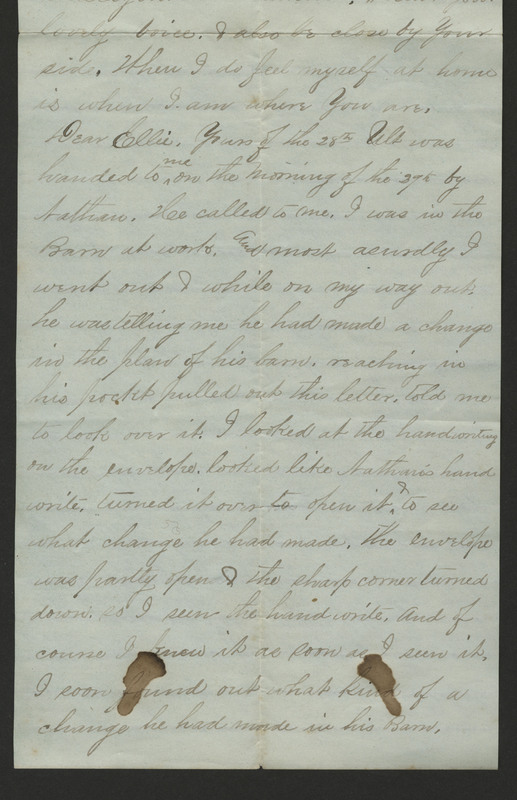 reaching in his pocket pulled out this letter. told me to look over it. I looked at the handwriting on the envelope. looked like Nathan's hand write. turned it over to open it & to see what change he had made. The envelope was partly open & the sharp corner turned down. so I seen the handwrite. And of course I know it as soon as I see it. I soon found out what kind of a change he had made in his Band.